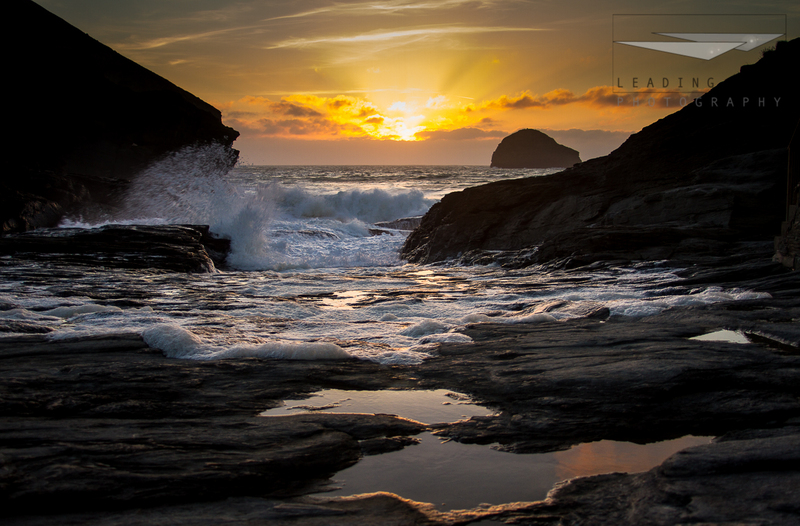 One evening recently I went to Trebarwith Strand to catch a sunset. This is a popular place for sunset images because of the rocky path leading to the beach and “Gull Rock”, the island just offshore. Being early in the year, there was a heavy sea running giving spray over the rocks and the tide was high, well up to the top of the path. As I sat with the camera on the tripod, I watched the mist on the horizon rising to meet the setting sun and I was groaning inside, thinking it was going to ruin the sunset. It was quite a challenge, watching the rising tide and making sure the camera (and I) stayed dry. Eventually the light faded completely and it was time to retire to the local hostelry to enjoy a very good hot meal to warm up again. While there, I got chatting to some of the other photographers who were also there for the sunset, including Russell Wilcox of Landscapes of Cornwall. Swapping e-mails afterwards led to a workshop opportunity and I will be sharing some of the results of that soon! Thanks for your time, Russell. If you get the chance, do check out his images and the workshops he runs.